Our exciting collection of eyewear includes Barton Perreira, John Varvatos, LaFont, Ogi, Modo/Eco, Seraphin, Prodesign, Koali, LighTec, OGA, Nike, Flexon, Nine West, Skaga, Calvin Klein, Carolina Herrera, Trina Turk, Jones New York, Nomad, Lucky, Converse, Glen Lane, Elle, Pure Color, Camelot, Marchon, Otis & Piper, Miraflex, Liberty Sport, Eye-bobs, Bebe Sun, Vera Bradley, Silhouette, Columbia, Costa and Maui Jim. 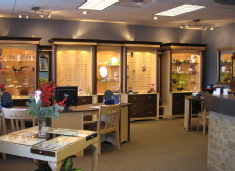 We strive to offer the newest technology in lens materials and designs. We choose to offer premium lens products and premium progressive lens designs to help you achieve clear, comfortable vision. High quality, ophthalmic sunglasses are not only a luxury, but serve an important role to protect your eyes from harmful UV radiation. We feature a full-line of Maui Jim www.mauijim.com sunglasses as well as various others to meet your UV protective needs. More than 600,000 eye injuries related to sports and recreation occur each year. We offer a unique selection of recreational glasses that offer impact protection and safety for use during any sport.